BRING YOUR OWN TBALL TEAM!! Want to guarantee your son/daughter gets to play with their friends this summer? Want to demonstrate school spirit? Sign up for our Team Registration so your school can have a team. 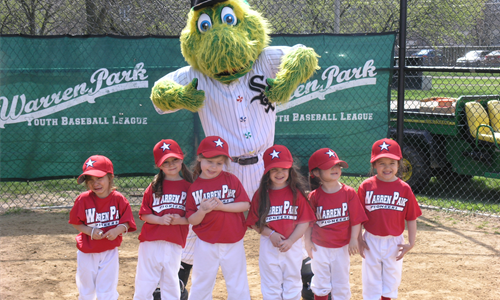 Warren Park Youth Baseball Little League TBall is for children ages 4-5 as of 8/31 this season. Practices start in early May and the season runs from late May through early July. Players hit off a tee for the first half of the season and may be pitched to by coaches during the second half. The season will consist of 10 games, weather permitting. Game will be played on M,W and F evenings at Warren Park or Senn High. WPYBLL TBall will consist of both coed and an all female teams. Female participants have the option to play for a coed team or all female team. Both coed and all female TBall teams will participate in the same division. If you are interested in the all girls TBall team, please select Pioneers at registration. For the TeeBall division players wishing to play on the same team as their friends, parents should choose the same team preference as those friends. Note: Teams have player limits and there are no guarantees player will play with their preferred team choice. By choosing no preference, the player will be placed in the draft and be eligible for any team. Choosing a coaching preference will give the player a better chance to be selected by that coach. Some teams are listed without coaches and appear as 'Coach TBD'.